Odyssey Introduces NEW Glide Style Carpeted Covered DJ Coffins(CD coffins also available).These coffins are made to the high standards of our Flight ATA coffins and offer the same protection and versatility that only Odyssey can make. Every DJ will tell you, only Odyssey makes it right for today's serious DJ's. 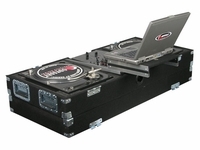 Our CGSBM10 will hold two Turn tables in battle position and and a 10"/12" mixer. 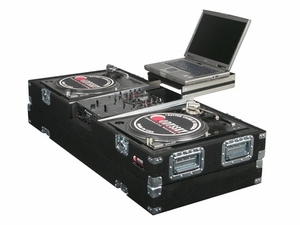 � Includes foam adjustable Mixer/Turntable width strips � Full foam lined interior � Recessed hardware and latches � Fits most 10" mixers out there � Can accomodate Numark, Stanton, and Technics turntables. *Custom Carpeted Glide Style Configurations Available. ote: PLEASE DO NOT TRANSPORT YOUR LAPTOP IN THIS CASE. DAMAGE MAY OCCUR.